Antony Hegarty loves themes. So, it’s no surprise that the fourth album from Antony and the Johnsons, Swanlights, opens with the insistence that “everything is new” and ends by repeating this line with the added image of “your face and my face / tenderly renewed.” Between these points, Swanlights is an evocative, but flawed, journey up a sonic mountain and back. Swanlights‘ fault is that it feels, especially in its opening third, as if it wanders with little destination in mind. Openers “Everything is New” and “The Great White Ocean” are gorgeously structured – is there any Antony song that isn’t? – but aside from introducing some of the album’s major leitmotifs, they struggle to create a definite draw. This is not a thick sounding record. There are only a few songs where a dedicated percussion section can be readily identified. It’s this more ethereal sound – string sections, classical and jazz tempo shifts – that gives the album a feel of disembodiment. But perhaps that’s the point. Swanlights works, especially in the run of songs between “I’m In Love” and “Fletta,” when the album juxtaposes these airy moments with more dominant ones. “I’m In Love” rides on a hypnotic keyboard loop and a tinny rhythmic backbone that lets Antony’s vocal flights truly seem grounded in something. The title track uses backwards masking of vocals and music to create a bed of droning, vaguely Middle Eastern sounding support for one of the album’s most lyrically affecting moments and its musical peak. 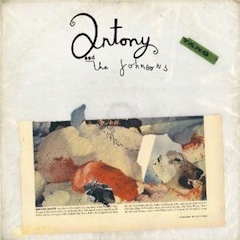 And Antony’s duet with Bjork on “Fletta,” which follows the most upbeat song on the record, “Thank You For Your Love,” is a sparse, piano-driven exercise in putting two intensely unique voices astride one another to excellent effect. Though some of the songs in this section are just as untethered as the earlier ones, they work much more effectively surrounded by these counter moments. I like Swanlights, but I think it works better in its entirety than each individual song. I don’t think it’s necessary for there to be one really great song (though, I guess, in the age of iTunes, maybe it is), but when you’re listening to something for the first time, it helps, and I’ve only listened a couple times. I was tempted to hit skip a lot. @Kathy – It did a lot better for me the second time through in terms of sort of knowing what to expect and how to approach it. My approach to records has (for the better and worse) been tempered by over a decade of working as a college radio DJ and listening for good singles in everything I hear. On the whole, I’m digging this record the more I listen to it, but it’s not an immediate grab the way moments of I Am a Bird Now were.